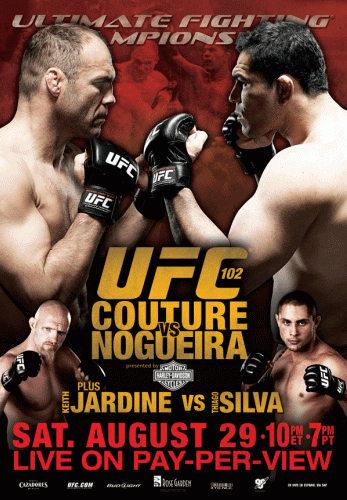 UFC 102: Couture vs. Nogueira was a mixed martial arts event held by the Ultimate Fighting Championship (UFC) on August 29, 2009 at the Rose Garden in Portland, Oregon. It featured former UFC Heavyweight and Light Heavyweight champion, Randy Couture, facing off against former PRIDE Heavyweight champion and former UFC Interim Heavyweight champion, Antônio Rodrigo Nogueira. Randy Couture was originally offered a title defense against Antônio Rodrigo Nogueira at UFC 81, however turned the fight down after his resignation from the UFC in October 2007. While Couture and the UFC sorted out their legal issues, Nogueira defeated Tim Sylvia for the UFC Interim Heavyweight Championship becoming the first fighter to hold both PRIDE and UFC title belts. Nogueira was then set to coach against Frank Mir on the eighth season of The Ultimate Fighter with the two facing off for the Interim Championship after the season aired. In the meantime Couture and the UFC reconciled and it was announced that he would return to the Octagon to defend his title against Brock Lesnar at UFC 91. Neither Couture or Nogueira were successful in their defense efforts and then faced each other in what amounted to the losers bracket of the UFC's mini heavyweight tournament. A previously announced bout between Kyle Kingsbury and Razak Al-Hassan has been moved to UFC 104 in Los Angeles, California on October 24, 2009. Matt Hamill pulled out of a bout with Brandon Vera due to injury. Krzysztof Soszynski took his place. A knee injury has forced James Irvin out of his bout with Wilson Gouveia and was replaced by Ed Herman. On August 7, 2009 it was reported that Gouveia was also off the card due to a back injury. Marcus Aurelio will be replacing an injured Matt Veach.